Litl Computer is to netbooks as iPods were to MP3 players. The beauty of the iPod was that it was designed to fit people’s worlds. It fit physically and it conceptually allowed users to find and get music from the web without being transfixed by technology. Imagine a laptop built from its roots to be an easy, maintenance-free interface to the web. That’s what Litl does. Like the iPod, it has its own OS and unique hardware design to be an interface between your home life and the web. So what does that mean for you? No folder-inside-another-folder metaphor. Use search, or the content wheel, to find stuff easily. No browser to turn on: the web is available as part of the OS. 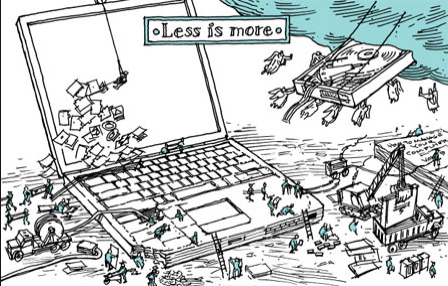 No big hard drive – Litl makes it easy to use the web. The machine is just an interface to the cloud. No synching or back-up headaches. Unlike iPods, your Litls can automatically synch to each other. No moving parts. Well, there’s a tiny fan, but the rest is pretty much solid state. And freed from old conventions, new things are possible. Web experiences use the whole system, not just the browser window. Imagine viewing a website more like a TV channel than a readable page. Easy to use in “watching” mode, as a monitor or feeding your large-screen TV. There’s little to break. Your information is stored in the cloud; the Litl is just an easy way to get to it. It’s really portable, just 3 lbs, and can sit up as an easel on a kitchen counter, bathroom sink, or back deck. Every few days I’m reminded that simplicity is the good manners of our age. For me that’s a mantra, and for Litl it seems to be a product strategy. 3 Responses to "Litl Computer: Meet the Next Apple Computer While It Still has 40 Staff"